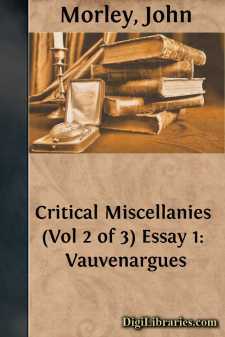 One of the most important phases of French thought in the great century of its illumination is only thoroughly intelligible, on condition that in studying it we keep constantly in mind the eloquence, force, and genius of Pascal. He was the greatest and most influential representative of that way of viewing human nature and its circumstances, which it was one of the characteristic glories of the eighteenth century to have rebelled against and rejected. More than a hundred years after the publication of the Pensées, Condorcet thought it worth while to prepare a new edition of them, with annotations, protesting, not without a certain unwonted deference of tone, against Pascal's doctrine of the base and desperate estate of man. Voltaire also had them reprinted with notes of his own, written in the same spirit of vivacious deprecation, which we may be sure would have been even more vivacious, if Voltaire had not remembered that he was speaking of the mightiest of all the enemies of the Jesuits. Apart from formal and specific dissents like these, all the writers who had drunk most deeply of the spirit of the eighteenth century, lived in a constant ferment of revolt against the clear-witted and vigorous thinker of the century before, who had clothed mere theological mysteries with the force and importance of strongly entrenched propositions in a consistent philosophy.